For over a decade, Benefit Services of America (BSA) has partnered with the nation’s top credit unions, associations and businesses to provide discount medical benefits. Administering Dental Benefits Max and OnCall Doctor, BSA has helped thousands of Americans save money on medical expenses. With Dental Benefit Max, BSA provides an affordable dental plan, offering over 400 dental procedures for as low as $9.95/month. And, with OnCall Doctor, BSA helps patients avoid a crowded waiting room or an often hard-to-get appointment, through telemedicine, consulting with a physician in the comfort of their own home, office or hotel and if needed, the doctor phones in a prescription to a Pharmacy that’s convenient to the patient. 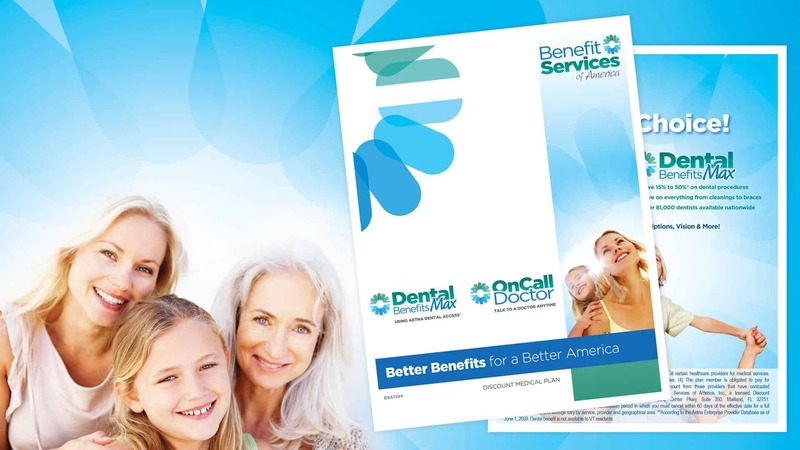 Benefit Services of America turned to evok for a complete rebrand and brand positioning. Our experience in the credit union industry afforded insight to the minds of a member association and our creative team, having worked with credit unions such as Fairwinds, Insight and Space Coast, creatively, understood what would resonate with the end consumer, motivating them to learn more about these benefits, offered exclusively through their credit union. Two service line brands under one parent, our team developed a color palette, logo treatment and brand style guide that incorporated the key colors from each industry – healthcare (blue) and financial (green) – that could be shared across the brands, yet still provided each brand with it’s own unique visual identifier. From direct mail to statement stuffers, rack cards, fliers and posters, conveying the features and benefits of BSA’s complementary service lines reached the consumer on multiple touch points. Since not every credit union within the network offered both services, and prices also varied across each institution, evok developed a website that housed general company information on the home pages, but as the consumer navigated through the service line pages, the website responded to provide the consumer with relevant information applicable to the services offered through their individual credit union.